Much though we might aim to eat only single-estate chocolate with 80 per cent cocoa solids, we all have a soft spot for one or more varieties of a far less high-falutin' type. The pleasures of the Toblerone, for example, cannot be denied: from the way the nougat sticks in your teeth, to the pointy ends that you can dip in tea to create gooey wizard hats. Toblerone is also especially good when cooked, because of its chewy lumps of nougat that create a thick, nutty sauce under a puffy layer of sponge in this pudding. 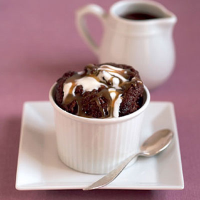 Crowned with a scoop of cold crème fraîche and a drizzle of caramel sauce, it has real 'Eat me!' appeal at the table. If it ever actually makes it that far! Preheat the oven 180°C, gas mark 4. Heat 100ml milk in a saucepan until boiling. Remove from the heat and stir in 150g Toblerone. Set aside. Mix together the flour, baking powder, cocoa, 75g sugar and the rest of the Toblerone. In a separate bowl, whisk 25g butter, the egg and the remaining milk together. Mix this into the dry ingredients. Divide into 6 x 200ml ovenproof dishes. Spoon the Toblerone sauce on top. Bake for 20 minutes, until it rises and is set on the top but wobbly underneath. For the caramel sauce, place the sugar and 3 tbsp water in a saucepan and heat until dissolved. Continue to cook until it turns a deep gold, swirling the pan so it colours evenly. Pour in the cream. It will hiss, and the sugar may 'seize', or form into lumps. If this happens, continue to heat it until it melts. Stir in 15g butter and the vanilla. Set aside. To serve, place each pudding on a plate to catch the drips and scoop a spoonful of cold crème fraîche on top. Finally, drizzle with the caramel sauce. Crunchie ice cream: take a tub of vanilla ice cream out of the freezer for 20 minutes to soften, transfer to a bowl and crumble 2 Crunchie bars into it. Refreeze for an hour until firm. Nigella's deep-fried Bounty bars with pineapple: make a batter from 150g self-raising flour and 200ml-225ml fizzy water. Dip in 8 fun-sized bounty bars. Deep fry in 1 litre sunflower oil for about 3 minutes in two batches, drain on kitchen paper and serve with fresh pineapple slices. This recipe is from Nigella Bites (Chatto & Windus; £20). Mars Bar fondue: melt 4 chopped Mars Bars with 100ml single cream and 25g butter in a heat-proof bowl over a pan of simmering water, stirring until melted. Transfer to a fondue dish and serve with strawberries or bananas. Chocolate orange croque: butter 2 slices of brioche and grate 4 segments of Terry's Chocolate Orange onto the unbuttered side of one slice. Sandwich together and fry, pressing with a spatula until melted. Serve with crème fraîche. Nigel Slater's chocolate Toblerone sauce: this nutty sauce recipe from Slater's Real Food (£15; Fourth Estate) is great with ice cream and pancakes. Make it by melting a 200g bar of dark Toblerone in a bowl over a pan of boiling water and stirring in 30g butter and 100ml whipping cream.